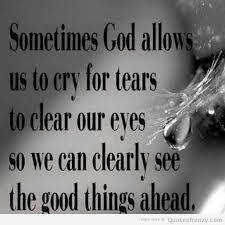 I thank God for the Grace He have bestowed upon our lives; by strength shall no man prevail. I worship God for His mighty hands upon all the treasured readers of this blog all over the world and the leaders. I am grateful O God for who you are; we exalt your name in Jesus’ name, Amen. Please find below our activities for the past week. There was no much activities for the week . On Tuesday October 6,2015, summary of lastweek activities ‎was posted especially for those that weren't around and our first timers to have a glimpse of how the parish operates. On Thursday October 8,2015 which was meant to be Women's Meeting/Fruitful Women's day but we didn't see them. Probably they had other engagements. Pastor Lucy took us through bible study titled "Why am I doing this"? It talks about our confession to loving God yet we fail to do his will. 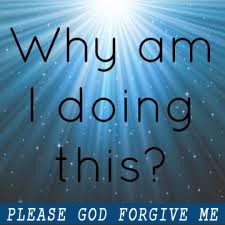 We were admonished to ask God for forgiveness of sins. May God answer our prayers in Jesus Name. We were asked some questions about the Holy Spirit and Fruits of the Holy Spirit. In all, we had 7 members including our Pastor as always. Thank you so much Chinco bee. God bless you. Amen. Please I am not going to take us on Bible study today, i have a mission that i must accomplish, this act is not intentional I never plan for this but sometimes we God messengers have to walk according to His instructions and let Him have His way. 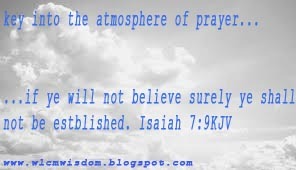 I have this burden in my spirit to pray for all the readers and leaders of this blog. Lord Jesus we thank you for the gift of life. We thank you for your Grace in our lives. We return all the glory to you for all the wondrous works you have done in our lives. please this post is directly from the Office of the the Blog Secretary, Chincobee. On Monday September 28,2015, there was visitation and the Pastor in charge visited all members. She shared the word of God with us(Bible Study). Members were admonished to study God's word and questions were welcomed which were directed to the Asst Pastor Gloria Okaiman. 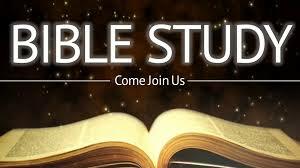 There was emphasis on the need to study the word of God, meditate all we have jotted during the service and also we are told to be doers of this word. Also, soul winning is very important as Christians. In all we had 9 members present including the Pastor in charge of the parish. On Saturday October 3,2015‎, Our Asst Pastor added a year to her years. The Pastorate prayed for her. Once again, Happy birthday Ma. May God teach you to number your days on earth. 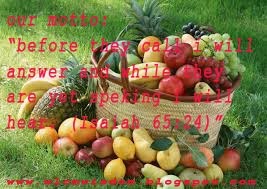 Do have a fruitful and blessed week ahead. "chichi dear, please am so sorry for the late post, forgive me please, I promise this will never repeat itself again. thank you and God bless you, Amen." please all the Blog department should please endevour to meet and share the Good news. intercessory group: Pst. 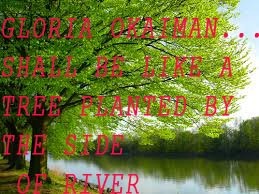 Gloria Okaiman. you all are great leaders, please lead well because a lot of souls are waiting to be touch by your words. may God empower you all with His Wisdom, knowledge and understanding in Jesus' name, Amen. please I thank you all for your cooperation. well done Chincobee, you've done Great!!! God bless you. 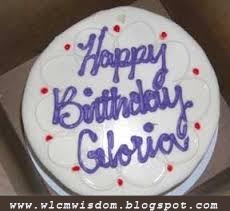 Happy Birthday to our Assistant Pastor, Gloria Okaiman!!! Hip! Hip!! Hip!!!Hurraaaay!!!!!!!! I’m not sure exactly when the bond started to grow so much between me, all the readers of wlcmwisdom blog and Gloria okaiman. On your special day, I have wishes for you, First is happiness, long lasting one that’s true, Forget all the sadness, please never be blue, Now give me a smile, a big one will do. There may be times that He’ll put you to test, Just call on me we’ll get thru it, don’t be depressed. 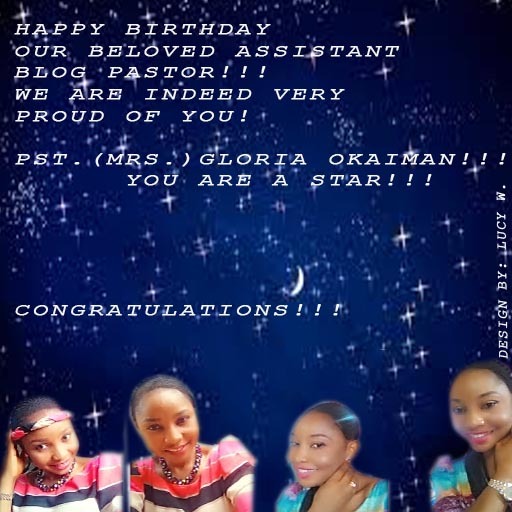 From my heart, Once again am saying a very happy birthday to you my friend and Assistant pastor. Keep smiling always and yes we will meet soon. And I will give you a long, tight hug. I LOVE YOU BUT JESUS LOVES YOU THE MORE!!!!! Therefore thy gate shall be open continually; they shall not be shut day nor night; that men may bring unto thee, the forces of the Gentiles, and that their kings may be brought. For the nation and king that will not serve shall perish; yea , those nations shall be utterly wasted. For brass I will bring gold, and for iron I will bring silver, and for wood brass, and for stone iron: I will make thy officers peace, and thy exactors righteousness. Violence shall no more be heard in thy land, wasting nor destructions within thy borders; but thou shall thy wall shall be call salvation, and thy gates praise. A little one shall become a thousand and a small one a strong nation: I the LORD will hasten it in his days. Isaiah 60:1-3,11-12, 15, 17-18, 22.